A Web Form is often used on a "Contact Us" page. It allows your visitors to contact you through a structured form that will send you response notifications from visitors that have used it to reach you. 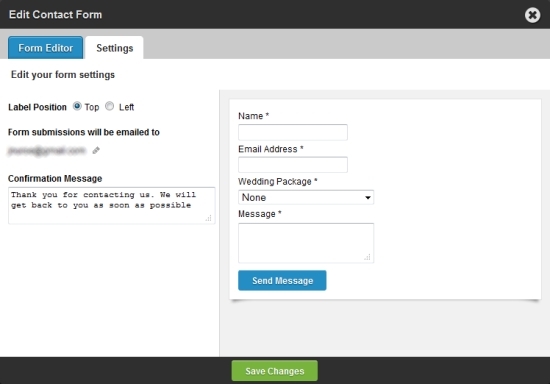 You can create a contact form by adding the form module to a page. NOTE: Contact form label customization is a Premium feature. Click here to upgrade your site with a Premium package. TIP: Use the Contact Form module along with the Contact combo module (located under the "Combos" tab) in order to create a full-featured Contact Page. Step 1: Add the module by selecting it from the General tab at the button of the Builder and dragging it to an empty area on the page. Step 2: Once the module is in place, you’re ready to begin editing the form. Click the edit form button that appears in the formatting toolbar at the top of the builder. This will bring up the “Edit Contact Form” page, where you can adjust the look and behavior of your contact form. 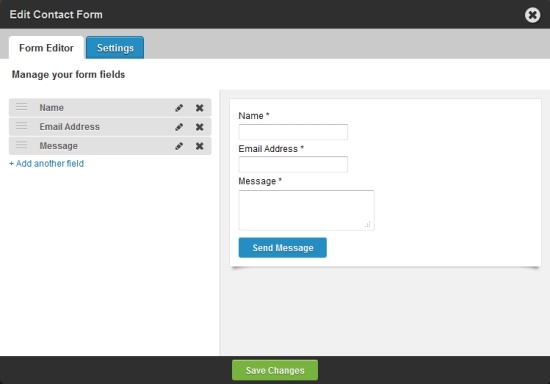 From the Form Editor tab you can change the fields that appear on your form. As you make changes, the preview pane to the right will update to reflect your edits. Each form item has three actions: move, edit and delete. Click add another field to add a new form item. Additional options will appear according to what type of form element you chose. Form submissions will be mailed to: the email address where you wish for submissions via your form to be sent. If you do not enter an address you will not receive your messages. NOTE: The number of form submissions you are able to receive per month is dependent upon your account type. Free and Domain Only sites receive 25 monthly submissions while Starter, Enhanced and Pro packages receive 1,000. Click here to upgrade your site with a Premium package and get more form submissions. The subject line of form responses will read "Webs.com: FORM RESPONSE" and will come from notifications@webs.com or form-processor@webs.com. Be sure to add notifications@webs.com to your address book to ensure that form notifications are being received. In this notification email you will also be able to view how many form submissions you have left based on your account type. Form submissions are delivered to the email address that was entered into the form settings. If you are using a Webs-hosted email address for your form, please log in to webmail at webmail.YOURDOMAIN.com. Once there go to Options > SpamShield Pro and authorize notifications@webs.com and form-processor@webs.com. Make sure that your forms are not being sent to a forwarding address (an address that passes mail along to another e-mail address). How many form submissions do I get per month? Premium Package accounts provide 1,000 submissions. Free or Domain-Only accounts have 25. What happens if I have exceeded my monthly submissions? If a visitor submits a form and you have already exceeded your monthly allowance, the message will not be sent. By that time you will have received a notification stating that you have reached "0." How can I change the email address that responses are sent to? 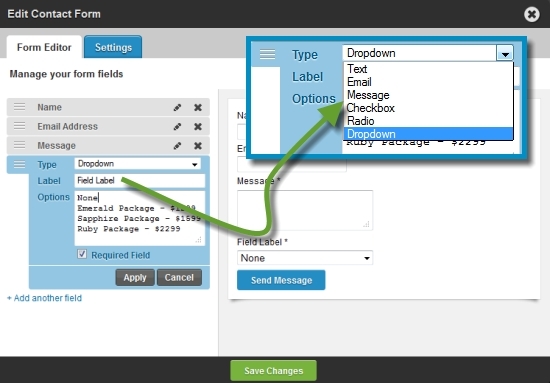 The send-to address is defined in the Form Settings. By default, there will be a placeholder example address that you need to change to your email address. If you do not set an email address, your messages will not be sent. You will, however, still be able to retrieve them from the Dashboard. I got a message saying to enter a different field name. If you are unable to publish your contact form, you may have created a form label that is asking for sensitive personal information, which is not permitted.